There is no wrong way to position your baby at the breast. As long as your body and breasts stay comfortable and your baby is getting enough milk, there’s nothing you need to change. Humans have been breastfeeding since the dawn of time, and it was not until that last hundred years or so that women were given instructions for how to hold their babies at the breast. As long as everything is working, you can nurse upside down and backwards as far as I’m concerned. In fact, here’s a mom doing just that. Pretty cool, huh? It’s also important to note that nursing is not supposed to hurt. 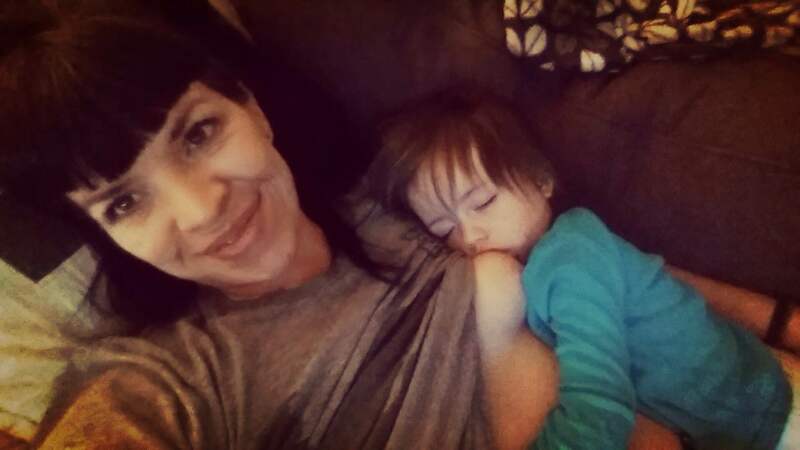 It’s normal for there to be a little tenderness in the first few days as your body adjusts to breastfeeding and as your baby gets the hang of it. But cracked, bleeding skin and toe-curling pain indicate that something isn’t working. Either the latch and position need to be adjusted, or there is something about the way your baby is sucking that needs to be addressed (tongue-tie is a common culprit, but there are other potential causes). If you are experiencing such pain, call your local La Leche League leader or an IBCLC for advice and help (or me! I offer consultations for mothers worldwide). You are not meant to do the breastfeeding thing alone – help is out there, and you and your baby deserve it! All that said, and assuming all else is going well with nursing for you, it truly does make a difference to your own body to nurse in a comfortable position! In the first many months, you will be nursing your little one quite frequently. It is normal for your bundle of joy to need to nurse every 1-3 hours (sometimes more! ), so sitting in an uncomfortable position while nursing can really take its toll on your body. Take a look at this lovely mom and baby, for example. You’ll notice that this mom is hunched a little forward. This is sometimes what moms do to latch a baby on, but it can strain a mom’s neck and shoulders to be doing this for many minutes at a time, many times a day. When I help a mother who is sitting like this, I give her shoulders a gentle push back, and I give her a foot stool to rest her feet on. If a foot stool isn’t available, a little table or even another chair will do. Resting her feet on a stool will help her lean back a bit, and open up her chest and shoulders. Next, look at this mom’s arms. She’s cradling her baby very sweetly, but much of the baby’s weight is being supported by her arms, which will end up feeling fatigued after long days of nursing. This mom is in a very traditional nursing position, one adopted by moms quite frequently. It was the position I was taught when my older son was a baby. Pretty soon we graduated to side-lying nursing (i.e., nursing lying down), which we found invaluable for sharing sleep and relaxing together. But in the time between the birth of my first baby and my second baby (almost six years later), a new, much more comfortable position for nursing has become popular, and rightly so! It’s called laid-back breastfeeding or biological nurturing, and is based on the research and work of Suzanne Colson, a midwife and breastfeeding counselor. Here’s a picture of a not-so-glamorous mom (me!) nursing in a laid back position. As you can see, I’m reclined quite a bit, but I’m not lying flat on my back. I have a bunch of pillows behind me lifting me up a bit. A reclining chair is great for this, as is sitting against the arm of a couch with your legs stretched across the couch. My neck and shoulders aren’t strained at all, and the amazing thing is that I don’t have to give my baby much support because gravity is keeping him in place! Nursing this way, with your baby completely tummy to tummy with you, allows your baby’s body to feel secure, and allows him to tilt his head back and get a nice deep latch. It’s relaxing for both mom and baby. My baby is four months here but we did it when he was a newborn, and I’ve helped many moms of newborns use this position. It’s a very natural position and helps newborns tap into their instincts to breastfeed. So there you go! 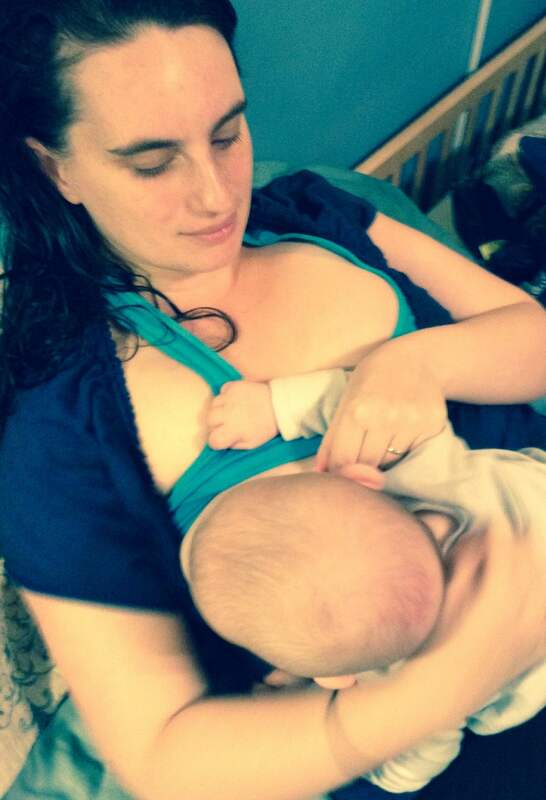 If laid-back or reclined breastfeeding feels right to you, try it. Even if you’re sitting upright, remember to lean back a touch so that you aren’t hunched. Your neck and shoulders will feel much more comfortable by the end of the day. Happy nursing!